Richard Irwin (Belper, United Kingdom) on 5 April 2007 in Plant & Nature. i tried for a very tight DOF in this shot, which was taken at ground level with a 50mm Sigma lens at about 1:1 magnification. I'm going to be away today, but I'll be back viewing and commenting on aminus3 photoblogs in tomorrow. Great close up, amazing details. Excellent! Brilliant DOFs and amazing details as told by zing. This is very impressive work, Richard! Way to go! This is a really cool shot, I agree the detail is perfect! Has an abstract look and feel. Love it. Very interesting! I love the abstract quality of it, and the subject is magnificent. The colors also add an unsuspecting, yet nice, twist. wow a gorgeous close up! for a minute there i thought it was a starfish, lol. love the dof! it works fine for me, love the details and colors. Oh, I am so jealous!! What an abso-fricken-lutely excellent macro! 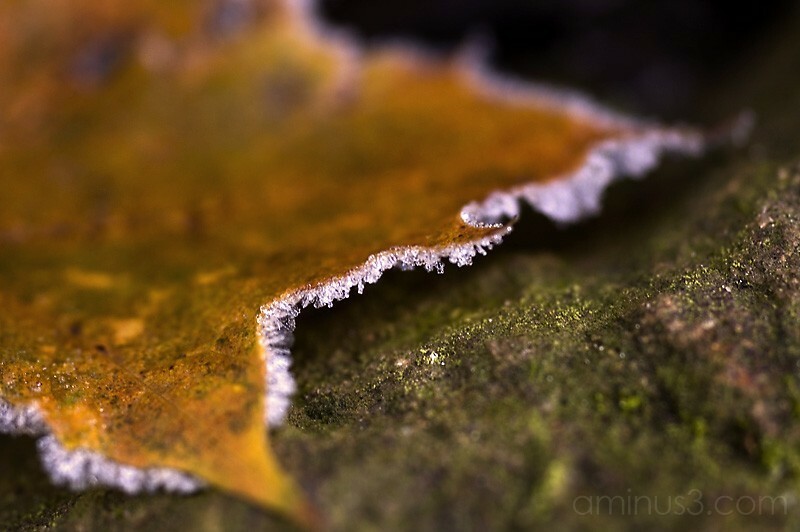 Even though the dof in the front right seems at first to be distracting it actually leads the eye to the rime of frost on the leaf. Outstanding.